The “itis” in plantar fascitis denotes inflammation of this ligament as it attaches to the heel bone. Pain associated with this inflammation is noted typically to the bottom aspect the heel bone. Pain is typically worse with initial rising from a sitting position such as getting out of bed in the morning or pain noted after arising from a prolonged sitting period. The cause of plantar fasciitis has much more to do with inherited foot mechanics and abnormal stress placed on the plantar fascia. Abnormal foot pronation which can cause increase stress to the plantar fascia appears to be one of the main reasons for developing this injury. One of the major causes of plantar fascitis is related to abnormal walking mechanics occurring during the “midstance” phase of the walking cycle. During midstance the foot is going through complex motion called pronation and supination. The pronated foot is a very flexible foot position that can accommodate abnormal walking surfaces while the supinated foot is a rigid state that prepares the foot to transfer the weight bearing pressures of the body into the swing portion of the walking cycle. Between the midstance and propulsive portion of the walking cycle the foot normally moves from a pronated position into a supinated position in preparation of lifting the foot off of the ground as it enters the swing phase of the gait cycle. 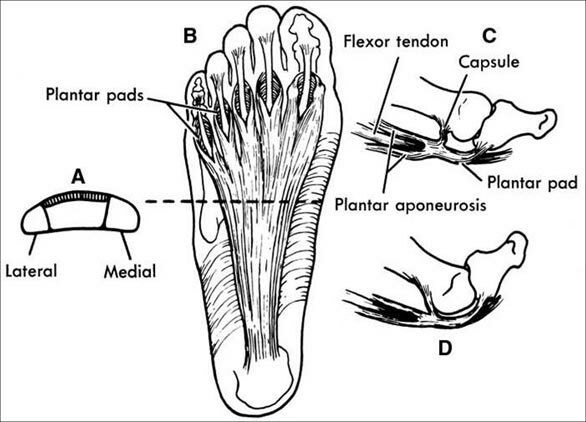 People who develop plantar fascitis generally stay in a pronated foot position as the heel lifts off of the ground. This pronated position increases abnormal pressures on the plantar fascial ligament which can lead to the development of plantar fascitis. Other contributing factors including non supportive shoe gear, poor conditioning while returning too quickly to athletic activity and excessive body weight have an influence in its development. Treatment is geared at stabilizing abnormal foot pronation with supportive shoe gear and orthotic as well as decreasing inflammation and pain at the plantar fascial attachment site. Stabilizing the foot biomechanically and controlling abnormal foot pronation is performed by wearing a very supportive shoe and over the counter orthotic device. It is very important during the period of treatment to avoid all barefoot, slipper or use of sandals and open backed shoes even around the house. The goal is to wear shoes at all weight bearing times including getting out of bed in the middle of the night to go t the bathroom. The analogy is that of a fracture. Successful healing of a fracture involves the use of a cast at all times generally for a 4-6 week period of time. If motion occurs at the fracture site healing is delayed. Although plantar fascitis is a soft tissue injury it is treated by removing the weight bearing stresses on the soft tissues with the shoe and the temporary orthtoic. We generally recommend a supportive shoe like running shoe with a rigid heel counter, supportive midsole and lace up features as well as the addition of a firm arch support. There are many different arch supports that are commercially available but in general any arch support that is “firm” as compared to “soft” is preferred. 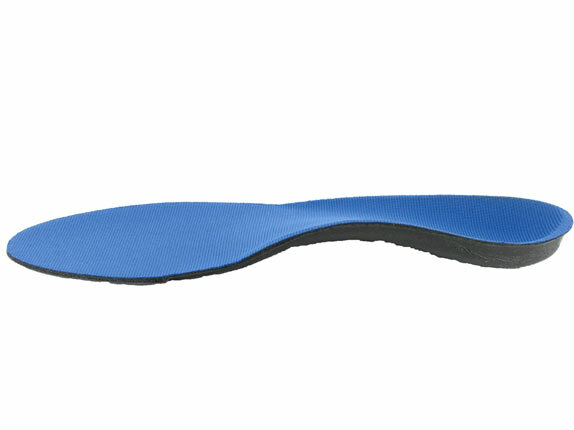 The initial thought when the heel hurts is to get an arch support that is “soft” but remember the main use of the orthotic arch support is to decrease abnormal foot motion. Usually an over the counter arch support rather than a custom orthotic will be sufficient to help control abnormal foot pronation. Special taping technique to limit motion and prevent pain. If custom orthotics are an indicated procedure for you, as determined by our evaluation, the following information covers our fee policy. Clinical outcome of surgical intervention for recalcitrant infero-medial heel pain. Does the use of orthoses improve self-reported pain and function measures in patients with plantar fasciitis? A meta-analysis. Treatment of plantar fasciitis using four different local injection modalities: a randomized prospective clinical trial. The efficacy of oral nonsteroidal anti-inflammatory medication (NSAID) in the treatment of plantar fasciitis: a randomized, prospective, placebo-controlled study. A running shoe built for the moderate to excessive over-pronator who requires a combination of cushioning and reinforced stability.